Less than two weeks ago that Tweet of an IGP announced that three people have been arrested for insulting Islam after Haron’s Din death. One of them is ex-journalist, Sidek Kamiso. Sidek was arrested at 4.30 AM at his house in Petaling Jaya without an arrest warrant. He was then taken to Johor Baru where the police request for remand was rejected..and he was free to go on bail. Let us recap : The police came to his house in Petaling Jaya last week at 4.30 AM without an arrest warrant, seized his phone and laptop and then took him to Johor Baru where their request to remand him was denied. 298. Uttering words, etc., with deliberate intent to wound the religious feelings of any person. Whoever, with deliberate intention of wounding the religious feelings of any person, utters any word or makes any sound in the hearing of that person, or makes any gesture in the sight of that person, or places any object in the sight of that person, shall be punished with imprisonment for a term which may extend to one year, or with fine, or with both. I wonder what they would do to me if I should be within the grasp of this Tweet of an IGP who licks Najib’s arse for a living for I have been known to not only call him a tweet but also have wrote worse things than that tweet that Sidek was alleged to have tweeted! 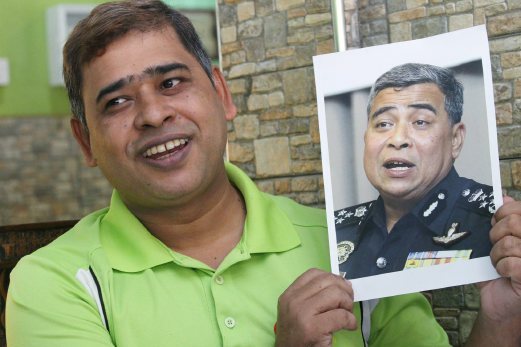 Sidek Kamiso and anybody else who tweets anything like the above tweet that Sidek Kamiso is alleged to have tweeted….will have the PDRM invade their house at 4.30 AM while they, their spouse and children are sleeping, have their phone and laptop seized and be taken hundred of miles from Petaling Jaya to Johor Baru presumbly to be held in custody in a police lock up……and all done without an arrest warrant! Then upon being release on bail because a Magistrate did not allow the police to remand him any longer…that person will be arrested a few days later for wounding the religious feelings of another person. Woi Najib, woi you tweet of an IGP…apa yang si Sidek ni buat to upset another Muslim? Ini bukan orang Cina or India yang hantar tweet ….ini orang Melayu! Orang Islam! Sidek did not step on or kick the head of a cow to offend the sensibilities of a Hindu. Sidek did not vandalize any Hindu Temple Idols. Sidek did not go around asking the Cina to balek tongsan. What he did was to tweet : Someone who made his career out of selling air jampi for any illness succumbed to his illlness in a modern hospital in San Francisco.#irony. The # hashtag before the word “irony” tags the word automatically so that when people want to look for “irony” related topics, Sidek’s post will come up. And what is the irony of Haron Din’s death? It is simply this – a very religious Muslim man, from a very religiouis Islamic political party had to go to America (not a very Islamic country) to get medical treatment. I do not expect that tweet of an IGP to understand what “irony ” means….so I do not expect this Tweet of an IGP to undertsand what it is that I am trying to explain….but I am sure there must be some one in PDRM who does understand. Can that some one please tweet to that tweet of an IGP and explain why Sidek’s tweet is simply an innocous tweet that made an observation about the irony of Haron Din’s death in a modern hospital in San Francisco in a not too Islamic country. Itu aja…dia bukan nak “wound the religious feelings of any other Muslim”….aisehman Khalid, steady sikit lah. Jangan lah terburu buru mengikut apa aja suruhan by the owner of the arse that you are licking! God help you when Najib is removed from office for you can be sure that the Rakyat and the incoming government certainly will not!